Use the music provided to inspire your writing! Visit "Writing Contests @ Writing.Com" for this month's current official contest! Third Place - "Sands of Eternity" by Graham B. The task is simple: Write a short story using the prompt above as inspiration! Based on the prompt above. While not required, you are more than welcome to include the song in your entry. Rated 18+ or lower. Graphic content is not permitted, including GC or XGC items. 2,000 words or less. A word count must be included in the body of your item (top or bottom, not in the intro/header). Newly written for this contest. Create your entry as a Static Item and keep it in your portfolio. Submit it using the survey form below. Submitted One Time Only. You may only submit one entry, so make it a good one! Edited Only Until the Deadline. Entries edited after the submission deadline may be disqualified from winning without notice. 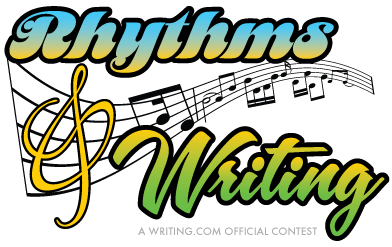 $100.00 in Writing.Com Gift Points and an exclusive Rhythms & Writing Merit Badge, both virtual and physical! $50.00 in Writing.Com Gift Points and an exclusive Rhythms & Writing Merit Badge, both virtual and physical! $25.00 in Writing.Com Gift Points and an exclusive Rhythms & Writing Merit Badge, both virtual and physical! Paid Membership Required. In order to be eligible to win this contest, each contestant must have a paid membership (Basic and above). Paid membership expiration dates must fall after the end of the contest round. You may need to renew your membership to be eligible. The free Premium membership trial does not count as a paid membership and does not meet the requirements for eligibility. Each judge will submit a scoring for qualifying entries to the contest. In the event a judge can not complete the judging, their scores will not be used, and at our discretion, a judging substitution may be used. In the event of a tie, staff will render the tie-breaking decision. Check this box to agree with the above statement. Disclaimer: The information submitted will be sent to Writing.Com Support . Do not submit anything private or confidential. Generated in 1.61 seconds at 6:08am on Apr 25, 2019 via server S30.